Welcome back. On occasion, I’ve ventured into the world of art, where I have no background (among other blog posts Authenticating Artwork Computationally and Authenticating Artwork Addendum). A study of the painting The Scream by the Norwegian artist Edvard Munch (1863–1944) has me venturing again. You’re probably familiar with the painting or at least the character portrayed, whether from reproductions, horror movies or Halloween costumes. But the study by researchers from the UK’s Oxford and London universities and Rutgers University focused on the sky, not the character. Munch’s graphical depiction may be the earliest visual documentation of a type of cloud largely unknown to atmospheric science at the time. The dates of artwork can be important when trying to identify possible sources of inspiration. Unfortunately, Munch is known to have been indifferent about dating his work, in addition to producing many versions of the same painting. There are four known versions of The Scream in paint and pastel. The National Gallery in Oslo, Norway, holds a painted version, dated 1893; the Munch Museum in Oslo holds a pastel version, dated 1893, as well as a painted version, undated but thought to be 1910; and a second pastel version, dated 1895, was sold for nearly $120 million in 2012. Munch also produced a lithograph version in 1895. Presuming that Munch’s painting captured the sky as he actually saw it, the researchers judge the event to have been either an abnormal or particularly striking sunset, a sunset affected by a volcanic eruption or some other meteorological phenomenon. The volcanic sunsets caused by the August 1883 eruption of Krakatau in what is now Indonesia is often posited as the cause of Munch’s blood-red clouds. Munch’s whereabouts and the dates of Krakatau-affected sunsets over northern Europe narrow his possible observation to the winter months of 1883. An alternative explanation, which the researchers favor over volcanic sunsets, was put forth in a 2017 study by a meteorological consultant from Norway and researchers from the University of Oslo and Norwegian Meteorological Institute. 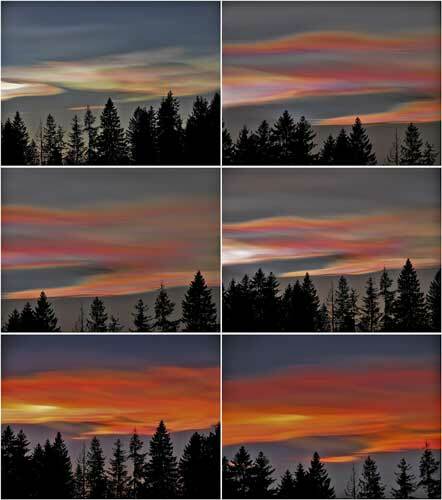 That study attributed Munch’s observation to nacreous clouds. Nacreous clouds are seldom seen, filmy sheets, unbelievably bright with vivid and slowly shifting iridescent colors, curling and uncurling in the winter polar stratosphere at altitudes of 15,000–25,000 meters (49,000–82,000 feet). They are best seen within two hours after sunset or before dawn. For the study, the researchers determined from the literature that nacreous clouds are sometimes observed during cold winter months in southern Norway. The clouds produce very dramatic skies, being most noticeable when the sun sets and clouds redden to what could be described as blood red. They also established that the direction and location of the scene depicted in The Scream are compatible with the direction and location for nacreous cloud observations. 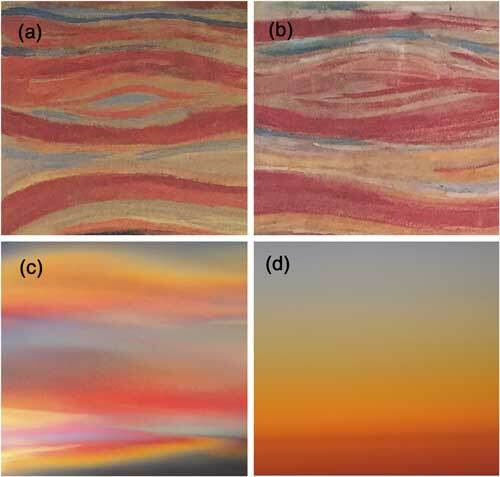 Going further, the researchers performed detailed analyses of the colors and patterns, comparing the sky and clouds in the painting to photographs of volcanic sunsets and nacreous clouds. Comparison of sky in (a) 1910 and (b) 1893 versions of The Scream with photographs of (c) nacreous clouds and (d) a volcanic sunset (from journals.ametsoc.org/doi/10.1175/BAMS-D-17-0144.1). The waviness in the sky in The Scream is absent in the volcanic sunsets, while a uniform progression from red to deep blue seen in volcanic sunsets is absent from the painting. In contrast, The Scream’s alternating patterns of colors and eye-like structure are evident in the nacreous cloud photographs. 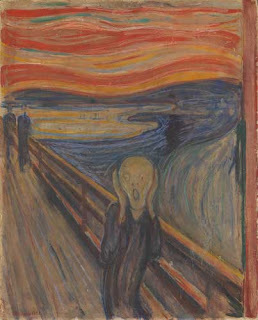 Although The Scream might have been inspired by a particularly striking sunset, a volcanic sunset or simply by Munch’s mental state, the sky depicted in the painting is remarkably similar to that of nacreous clouds. Reiterating, if Munch did observe then paint his sky with nacreous clouds, The Scream would likely be their first graphical depiction. This would be relevant to atmospheric scientists, particularly to those interested in the historical aspects of the development of cloud science. Thanks for stopping by.